Advanced Football Analytics (formerly Advanced NFL Stats): Should GB Have Let CHI Score the TD? 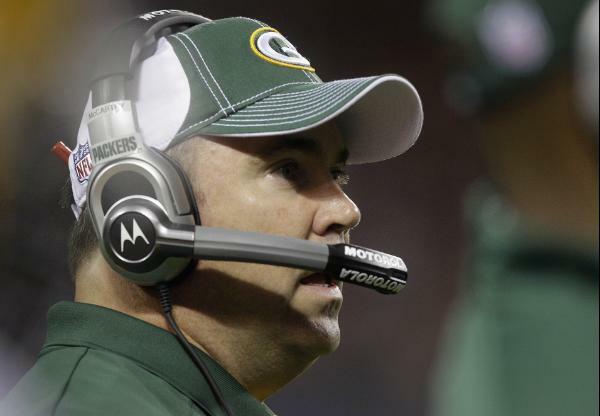 Mike McCarthy missed an opportunity Monday night. With the score tied at 17 and 1:44 on the clock, the Bears managed to earn a 1st and goal from the 9. The Packers had only one timeout, so CHI could run nearly out the clock and kick a field goal if they chose. FGs from that range are successful about 94% of the time, and with the good conditions, it's probably even higher. Had CHI scored a TD on 1st down, that puts GB down by 7 with 1:40 to go, which gives the average team about a 10% chance of winning. A FG attempt after 3 clock-burning runs, gives GB almost no chance to win. GB's only hope would be to prevent a TD on 3 straight downs and hope a FG misses. Depending on which down a possible TD might occur, the Win Probability (WP) for trying to stop the score is less then 0.03. A FG misses 6% of the time, which could lead to a tie at best at the expiration of regulation time. Assuming a 50/50 chance in OT, that's 0.06 * 0.5 = 0.03. By not allowing CHI to score the TD on 1st down, McCarthy cut his chances of winning from about 10% to about 3%. Neither prospect is very appealing, but every little bit matters. "A FG only misses 94% of the time" should be "A FG is successful 94% of the time"
I quickly came to the same realization. GB should have allowed the TD. Would Forte have pulled an MJD? If both teams realized that it was in GB's interest to allow the TD, what would happen? I suppose Chicago would just take knees and run down the clock, then kick the FG with as little time left as possible? How often does this happen, that a team runs down the clock in order to kick a game-winning FG, instead of at least making a token attempt at a TD? "Had CHI scored a TD on 1st down, that puts GB down by 7 with 1:40 to go, which gives the average team about a 10% chance of winning." Actually a touchdown is only worth 6 points. One would have to take into account the probabilities of CHI missing the extra point, converting the extra point, and going for two (possibly on a botched snap) and making it. Where did the 10% come from? On the two minute drill article http://www.advancednflstats.com/2009/11/two-minute-drill.html, it looks like the probability of getting a TD from the 30 (about where the kickoff would average) is about 30%. Multiplied by a 50% shot in OT, thats 15%. Was that adjusted for the probability they'd score so quickly Chicago could score again in regulation? I also feel like 94% seems low for whats basically an extra point in perfect conditions. Its pretty obvious this was a huge mistake by the Packers. Although the Bears made just as big a mistake by not kneeling. It's kind of sad that neither team made the statistically sound decision that was obvious to many viewers (including the commentators, primarily Tirico). I think that the Bears were probably instructed NOT to score. On the last carry, it looked to me like he was diving for the 1/2 yard line in the hopes to be down there. But maybe I'm just remembering it wrong. "I think that the Bears were probably instructed NOT to score. On the last carry, it looked to me like he was diving for the 1/2 yard line in the hopes to be down there. But maybe I'm just remembering it wrong." If this were the case, they probably should have just taken a knee or milled around in the backfield instead of exposing themselves to a possible fumble. Phil-Not sure how often it happens. Teams usually try to score, but are hyper-conservative to prevent the risk of turnover. Last season, Maurice Jones Drew took a knee at the 1 yd-line so the Jaguars could run out the clock rather than take the lead and leave time for the Jets to come back. See the link in my comments above. Unfortunately, it happened the same day as the infamous Belichick 4th down call, and the story was lost to obscurity. Jeff-The difference has to do with the time remaining. Anonymous-Thank you for pointing out that TDs are really 6 pts and the XP is not automatic. However, XPs are >99% successful, which makes the possibility of a miss less than a rounding error. FYI, the first link there is to localhost. Has any NFL coach who did instruct their defense to allow the score ever admitted to it? Holmgren, I think, in SB 32. This article got cited on NFL Live. Congrats! It's not clear whether Forte was trying/not trying to score on 2nd or 3rd down. Only he and Lovie Smith really know. If you look at his run on 1st down though, it seems like maybe he could have remained upright and scored, but it's hard to tell whether his left leg had already touched the ground. It would be easier to tell if they had another angle of that run. Brian and everyone, can you take a look at his 1st down run and tell me what you see? Forte's ypc by year: 3.9, 3.6, 2.8. It's quite possible he was trying to score but failed since he's not very good at the whole running with the ball thing. The differences in winning percentage is much greater than in the post, making the MM decision even stupider. Here’s why. Under the MM decision, the chance that a RB will fumble the ball on a given play is about 1 in 100 or 1% The Bears ran the ball three times, so that’s 3% chance of a fumble on that sequence. Then the Packers needed to recover the ball, say a 50% chance, and win in OT, 50% chance, or in regulation starting from the 5 yard line with a minute or less left needing a FG (20%?). 3% x 50% x (50% + 20%) = ~1%. The MM strategy also works if the Bears miss the field goal and win it in OT. The post says kickers make that kick 94% of the time. Robbie Gould makes that kick EVERY time. For his career, he is 40 for 40 from under 30 yards and 179 for 180 on PATs. The odds of a FG miss are too remote to even factor in. So the MM decision would work 1% of the time. Under the Let Them Score Scenario, the Packers get a kickoff to return. What is the chance that gets returned for a touchdown? 1 in 100? If so, we are already break-even with the MM strategy before we even consider the odds when Rodgers gets the ball. (It is not clear whether the Advanced NFL Stats includes the kickoff return possibility. Based on the limitations of the calculator on their website, I would guess no.) The post says the odds of the “average team” winning down 7 points with 1:40 left is 10%. Rodgers was the 4th ranked QB last year. The Bears defense is 28th in passing defense this year. Not average teams. So the Packers had AT LEAST 10x better chance of winning if they let the Bears score. Worst, this kind of scenario happens all the time. McCarthy either knowingly chose the clear losing strategy or was unprepared to make the decision. Dumb as a box of blocks. I agree that this analysis is overly conservative. The 94% FG percentage is too low. That number comes from all kickers and in all weather conditions. This was a perfect weather kick from the third most accurate kicker in NFL history who has NEVER missed from inside the 30. Likewise, the 10% number is way too low. As another commenter pointed out, this same site cites a 30% success rate for the two-minute drill from the 30. And even that is too low, as the Packers have a high-powered offense and were moving the ball well went they weren't committing penalties. I honestly don't understand how NFL coaches can run large, complicated organizations, be paid millions of dollars, and seemingly dedicate their entire waking lives to the pursuit of football and still routinely make bad decisions like this. I think it's unforgivable even for players to make these mistakes, like Seattle's Earl Thomas running around the field after his game-clinching interception yesterday. But it's downright absurd for head coaches to make such poor strategic decisions. In my Google Reader, these last few stories show up as a limited text teaser paragraph. Any chance you can change it back? Love reading your articles on the road, loaded up in my reader. I know you wanna drive traffic to your website, but not sure that limiting access to RSS readers helps. I actually don't mind having to click through for the stories, but whatever has changed is also doing screwy things with the comment thread, and I find it a bit annoying to have to click through to read every comment. Given the struggles the Bears had in Week 1 (that were discussed here as well), I would suspect they were trying to score at the end. This analysis was brought up during the radio coverage as it was happening, I think by Boomer Esiason. Not sure if the TV guys mentioned it, but Boomer was strongly pro-let-them-score. What about the odds of Chicago fumbling when running the football on those three downs? Doesn't that factor in somewhere? "Like presidents who lie in order to stay in power, because they know they are the best leader for the nation, it is important that I remain head coach, because I am the best coach for this team. If I let them score, I gain 7% of a win, but I am 100% likely to be pilloried for the decision. Except on Advanced NFL Stats. This means that I have some higher level of risk of being fired if my team doesn't win the NFC this year. Hence, I will play it safe." Obviously the head coach and president in that case would be deluded, since hurting your "country" to stay in power is the utmost in arrogance and selfishness and thankfully there are dissenting voices to point out such arrogant wrong-headed thinking. Let's not be too harsh on coaches. I bet the real story is that McCarthy thought about letting them score, but was unarmed with the information he needed. The worst possible outcome would be to let them score and have it turn out to be the wrong call. He hadn't thought it through ahead of time, and things simply happened too fast. The default decision is to play defense, so he went with that. "I wasn't sure what to do, so I stuck with the default," doesn't play well. Homlmgren was scorched by the fans for letting Denver score in that Super Bowl. I think McCarthy was damned if he did and damned if he didn't in the court of public opinion.